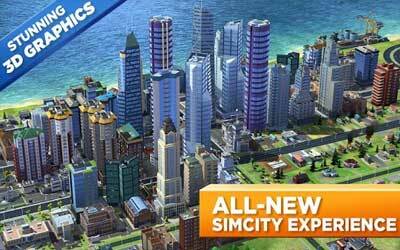 This is old version SimCity BuildIt 1.14.4.46220 apk for Android, you can install it if you want to downgrade or install old app. It is top Simulation apps from ELECTRONIC ARTS. First, you have to build a factory to produce metal and wood as the building material. Before you build in excitement, you need to remember a simple rule on this game. The building should be build close to the road. Fortunately, you can build the road easily by swipe the screen. Being governor is not only building the necessary infrastructure of the city. There are plenty jobs waiting ahead of you. You are also need to make your citizens happy. You need to fulfill their daily needs. It is important for a city to have power plant, water treatment facility, park, and other stuff. Besides the material, to build those infrastructures, you are also need money. The SimCity BuildIt has unique system for money collection. If your citizens happy, the will give you more taxes. Alternatively, you can sell the building material from the factory.